Vote Hemp ALERT: Signatures Needed! Last week, Kentucky & Tennessee were issued seed import permits from the DEA. In Tennessee, this process took almost six months. The potential for this to delay optimal planting had many licensed farmers in the state on edge. 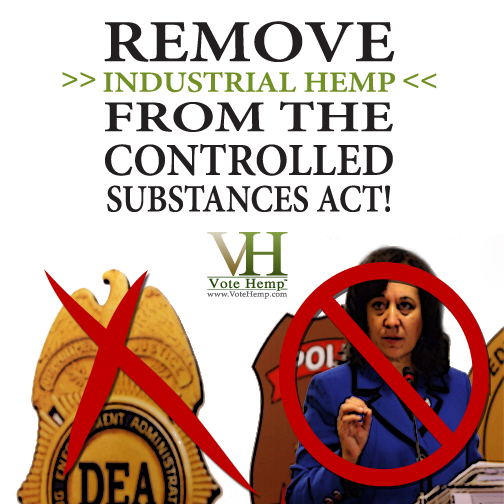 It’s time to remove the DEA from this process altogether by removing industrial hemp from the Controlled Substances Act. The Industrial Hemp Farming Act (S.134), introduced by Senator Ron Wyden (D-OR), is a legislative effort to bring hemp home to the United States. It would remove industrial hemp from the controlled substances act and give states the opportunity to establish industrial hemp as an agricultural commodity. The Industrial Hemp Farming Act currently has six co-sponsors — we need your help now to lend a name and a voice in support of this important legislation. Participate in this very important petition. Add your name today and show your support for the legalization of industrial hemp. It’s time to allow industrial hemp to become a domestically produced product. Vote Hemp is a national, single-issue, nonprofit organization dedicated to the acceptance of and free market for industrial hemp, low-THC oilseed and fiber varieties of Cannabis, and to changes in current law to allow U.S. farmers to grow the crop.